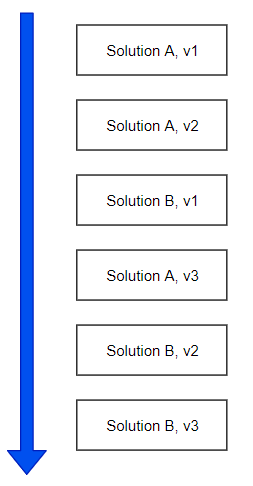 As I mentioned in the previous post, solution layering seems to be explained quite well in the solution lifecycle management whitepaper, so I figured I’d give a try to something here.. and, yes, it got a bit confusing. So, as expected, “Name” field kept its length in the target instance even though it had a different length in the updated version of the original solution. This is layering in action.. What about that new attribute, though? 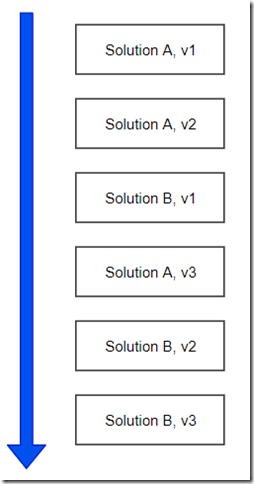 How did that attribute show up in the target instance if it was not included into solution B? In other words, why did “name” attribute changes did not show up, but that new attribute did, even though both changes were introduced in the updated version of the original solution? Ok.. one last test. Let’s change it to 120 and prepare another updated version of the original solution (not solution B). The import it to the target. Interesting stuff, so I figured maybe there is a slightly different explanation of layering. When looking at the timeline, it seems at least solutions are not installed in layers. Actually, maybe the whole concept of layering is a bit confusing since it’s not, really, all about layering. And, as for the unmanaged changes, they have the power to break that logic above by introducing a change “here and now”. Although, what happens when we choose to update unmanaged customizations when importing the managed solution.. Does that just remove unmanaged component version in the process?